The College of Law’s women’s basketball team on Sunday, Feb. 21, rallied from a six-point deficit in the game’s final minutes to upset the undefeated and two-time defending champion Suffolk Law School women to capture the title in the 41st annual Western New England Law Schools’ Basketball Tournament. The tournament featured teams primarily from the Northeast, including several Ivy League schools and Duke. The victorious College of Law women’s basketball players are, front row from left: Alycia Kimmel, Shannon Crane, Lahela Usui and Krystal Garcia. Second row,from left, Shannon Robin, Carly Halpin, Katie Boumans, Selbie Jason and Shannon Kane. 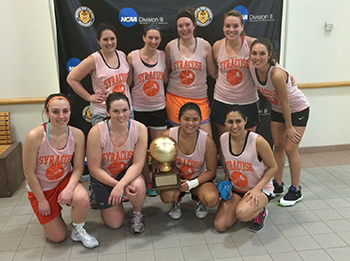 First-year law student Alycia Kimmel sank a three-pointer from the top of the key with a minute left in the game to cap off a furious late-game rally that saw the Orange squeak out a 27-24 victory. Kimmel’s basket gave Syracuse its only lead of the game. Suffolk, featuring a 6’3″ former college star who has towered over all opponents in the tournament the past three years, had been undefeated in the annual tourney since 2014, winning every game they played by at least double digits. They had defeated Syracuse by more than 15 points in the round-robin portion of the tournament on Saturday. The Orange parlayed a gritty defensive effort, using SU’s patented 2-3 zone, into the surprising triumph. Syracuse trailed by 9-0 three minutes into the 40-minute, running time contest, yet held Suffolk to 15 points over the final 37 minutes. Still down 22-14 midway through the second half, fierce interior defense and rebounding from forwards Katie Boumans, Shannon Crane and Selbie Jason, aided by harassing perimeter “D” by freshman guards Lahela Usui and Kimmel, suffocated Suffolk’s offense the rest of the game. The Orange parlayed high-effort driving and rebounding to tie up Suffolk with two minutes left on a putback by Jason. Refusing to hold the ball in a game with no shot clock, the fearless Kimmel then elevated with a minute left and sank her first three of the second half to give Syracuse the lead they refused to relinquish. The nine-player squad featured third-year forwards Shannon Kane, Carly Halpin, Shannon Robin and Krystal Garcia, in addition to Boumans, Jason, Crane, Kimmel and Usui. Each played significant roles in getting the team—which had to play five games in two days after a lengthy drive from Syracuse—to the point at which Kimmel’s last-minute jumper earned Syracuse its first tournament title in more than seven years.